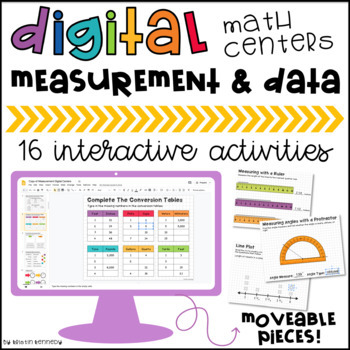 These digital math centers include 16 highly engaging, interactive activities for practicing measurement and data concepts. 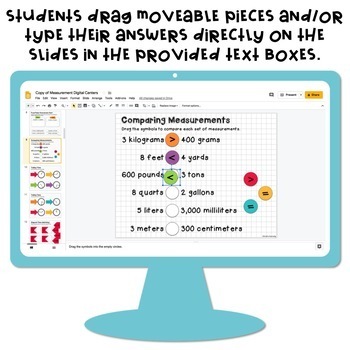 Each activity contains either moveable pieces or text boxes for students to type their answers. 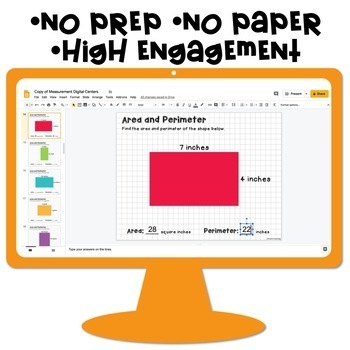 This resource is 100% paperless and requires no prep aside from assigning the activities to your students (directions are included). Answer keys are also included. Each activity contains detailed directions so your students can complete them independently at a center or for morning work/homework. 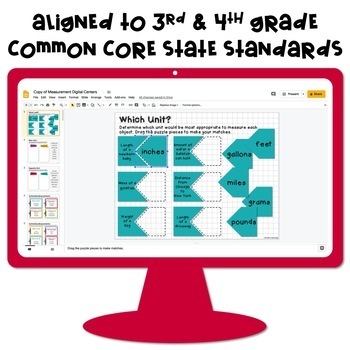 These centers are aligned to the Common Core State Standards 3.MD.1, 3.MD.2, 3.MD.3, 3.MD.4, 3.MD.5, 3.MD.8, 4.MD.1, 4.MD.2, 4.MD.3, 4.MD.4, & 4.MD.6. Please be sure you have a free Google account (preferably Google Classroom™) and access to the internet before purchasing. These activities deal with both U.S. Customary and the Metric System. There is a conversion chart included for student reference, if needed. If you like this style of digital math centers, be sure to check out my PLACE VALUE DIGITAL CENTERS, FRACTION DIGITAL CENTERS, and my GEOMETRY DIGITAL CENTERS.